?What Are Dentures and the Steps to Getting Dentures? Are teeth really that important? Daytime with Jerri Penacoli, are teeth really that important. We know that life with dentures and partials can be both a blessing and a curse. On one hand, it's important to remove teeth that are painful, broken, and infected. On the other hand, improperly-made dentures used to replace those missing or extracted teeth can make eating, drinking, and speaking very difficult. That's why at Sunshine Smiles, we take advantage of the most advanced techniques and materials to achieve truly extraordinary fit, comfort, esthetics, and function with all of our dentures and partials. Our highly-skilled dentists utilize a Precise-Fit Process to ensure that your new dentures look and perform as expected. Additionally, all of our dentures and partials are 100% made in the USA by a collaboration of our U.S. trained dentists and fully certified laboratories using only the highest quality materials. As always, we stand behind our work, so you can rest assured that your investment is covered. Payment plans are available, and your new dentures can be had for as little as $59/month, so call us or click here today to schedule an appointment. 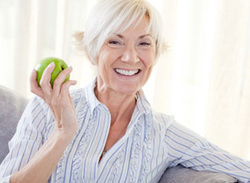 Let us show you just how easy and wonderful dentures can be! Custom-made to fit the anatomy of your jaw. If extractions are needed, you'll receive your dentures on the same day the extractions are done. You'll never have to be without teeth! Complementary permanent soft-liners available at your request.